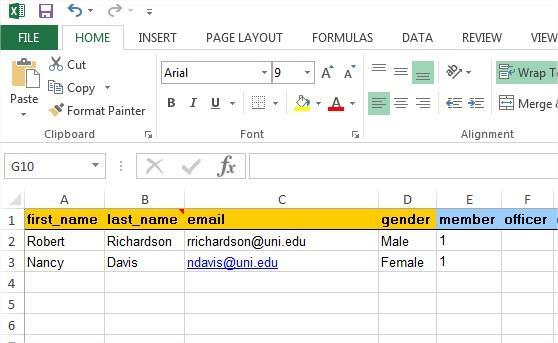 You can add multiple members to your group at once with our Excel template. Mouse over the "Members" menu and click on "Import". 4. Download the cg_members.xls Excel file. 5. Enter the members in the downloaded file. Please follow the guidelines on the screen. 6. Upload your Excel file by clicking on 'Browse', select your file and finally click on "Preview Upload". Note: If your file is not formatted properly, an error will occur. Please review the 5 Don'ts at the bottom of this page or send your file to support@campusgroups.com. Some might already be in the CampusGroups database (because previously uploaded by other groups at your school). These members will be added to your group roster. Some might already be members of your groups and won't be uploaded again to your group roster. 8. Choose whether or not to send a notification email to all newly added members by checking the notification box displayed below. 9. Finally, click on "Upload". 1 - DON'T modify worksheet name. 2 - DON'T modify or move Fields. 3- DON'T leave any orange Field blank. 4 - DON'T change Gender Syntax, i.e. keep it Male / Female (no abbreviations, please). 5 - DON'T put any other Student Type than the proposed ones. BONUS - THE ULTIMATE DON'T ---> DON'T skip the guidelines displayed on the import page to make sure your import will be successful!